Chase'n Our Dreams: Six More Weeks of Winter! Happy Groundhog's Day? I guess that depends on if you like winter. 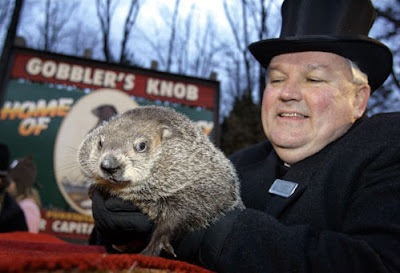 Punxsutawney Phil did see his shadow this morning, which means 6 more weeks of winter. However, his record of predicting only is only 40% accurate. One thing is for sure in my book though....groundhogs are not the cutest creatures by far!